The remnants and ruins of ancient Egypt, particularly Giza, are intriguing, and have been an enigma for thousands of years. No records exist describing who built the Giza pyramids or why. Over the decades and centuries there have been many theories proposed as to how these pyramids were built and why. Most theories describing the purpose of the pyramids, however, have been lacking in the application of science in the analysis of ancient Egypt’s past. One of the greatest of history’s mysteries is the Great Pyramid of Giza. Its structural perfection is matched only by its mysterious interior design, and at the bottom of this great limestone pyramid is a manmade cavern designed for what purpose? Of all the chambers and passageways in the Great Pyramid, the subterranean chamber is the largest and most unusual. 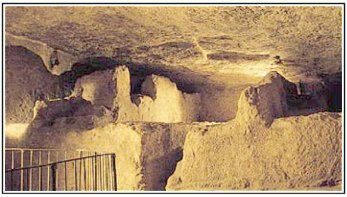 Located one hundred feet below the base of the Great Pyramid, this odd looking room was carved from solid limestone bedrock and measures twenty-seven feet north to south and fifty-six feet east to west with its entrance is near the floor at the northeast corner. While the eastern half of the room averages only 11 to 13 feet in height, the western half is five and a half feet high stepped with a tapered channel leading to the western wall. On top of the step two fins run from the front of the step to the back wall. A third fin was carved half way back on the step. All of the fins run east to west and reach up near the ceiling. On the main floor there is a six-foot wide square pit approximately five feet from the eastern wall and drops five and a half feet further into the bedrock where it narrows to four feet square. Although the depth of the pit is eleven feet, during the 1800’s Cavigula drilled down another thirty feet. In the subterranean chamber’s southeastern corner there is an entrance to a tunnel measuring 29 inches by 31 inches, often referred to as the ”dead end” shaft, which runs fifty-seven feet due south where it ends at a vertical wall. The Great Pyramid’s strange subterranean chamber is thought to have been an unfinished chamber. But after years of experimentation and model building it is now clear that the strange configuration of the Great Pyramid’s subterranean chamber is not an unfinished chamber. I have proven that the design of the subterranean chamber and its associated passageways is deliberate and are functionally equivalent to a pulse pump, commonly known as a ‘ram pump.’ The evidence is physical and any scientist or engineer may duplicate my work.